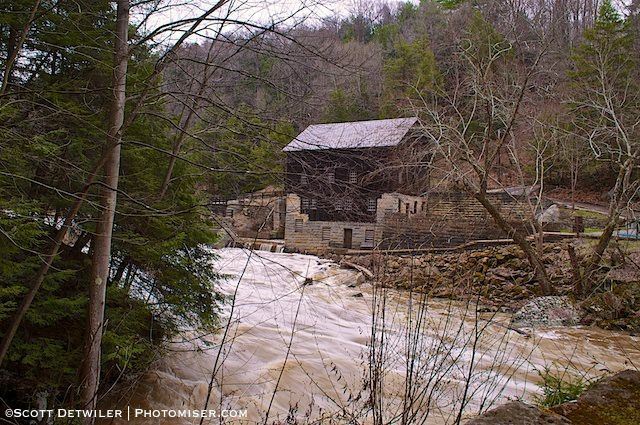 Surf’s up at McConnells Mill State Park after heavy spring rains this week. The water gauge on the side of the mill read almost six feet, one foot from the top at seven feet. Last month when I photographed the mill with snow and ice still visible, the water was below the gauge entirely. This should bring in the whitewater kayakers this weekend. I struggled with perspective here. If I straighten the wall, the waterfall pitches at an awkward angle. Since your eye spends more time on the waterfall, I decided to favor that over the wall. I keep the wall because the solid, unchanging surface contrasts well with the movement of the water. Image taken with the Nikon D90 and the best cheap Nikon wide angle, the Nikon 18-55mm AF-S VR DX. I wanted lots of water movement, so I slowed down the shutter speed as much as I could. ISO 100, f/20, 1/5 sec. I would have liked it even slower, but I would have needed a neutral density filter. Here’s bonus shot of the mill from across the creek today. This reminds me I have a few more shots of the mill I wanted to post from the previous visit. This entry was posted in Black and White, One Picture a Day, Photomiser Gallery and tagged 18-55mm lens, Aperture, McConnells Mill State Park, Nikon D90, Shutter speed.